What will you find when you allow yourself to go deeper? You’re not satisfied with the dry ground of religious intellectualism. You’re not satisfied with just dipping your toes into a shallow spirituality. You want to know the heart of God more intimately. 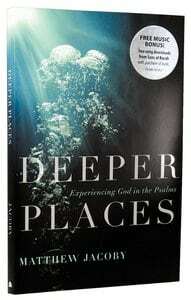 You want to encounter God in the deep places. 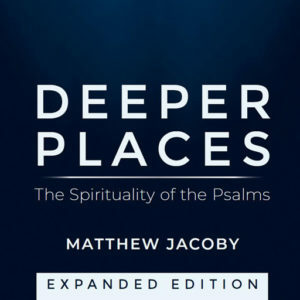 In Deeper Places, pastor and musician Matthew Jacoby shares a rich portrait of authentic spirituality that will help you dive deep beneath the surface to experience the kind of profound joy that the psalmists sang about. For over fifteen years, Jacoby has been studying the Psalms and setting them to music as they were intended. Now he gives you an in-depth look at the Psalms as a pathway to an intimate and satisfying relationship with God. “Few have understood the Psalms as well as Matthew Jacoby. He has sung them, taught them, and lived them for as long as he can remember. As such, he is a worthy guide for those seeking the more authentic, biblical, and earthy faith found in them.”-Alan Hirsch, author, The Faith of Leap, Untamed, and Right Here, Right Now. 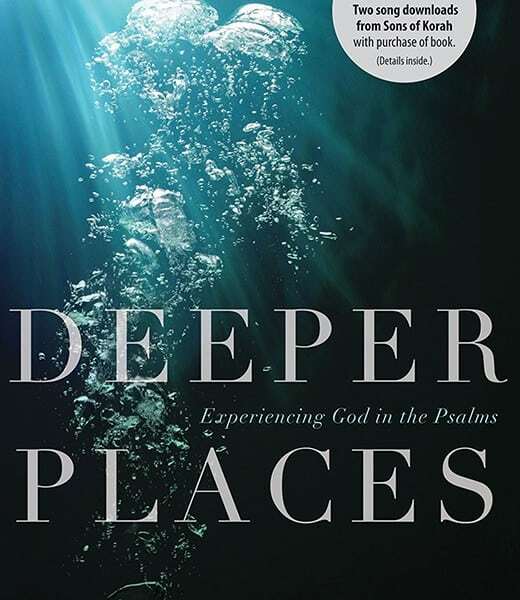 “Deeper Places is about knowing God, not knowing about God. Jacoby’s insights made me want to do something I’d not done for years: to make reading the Psalms a daily part of my life with God.”-Gary W. Moon, director of the Dallas Willard Center at Westmont College; author, Apprenticeship with Jesus. 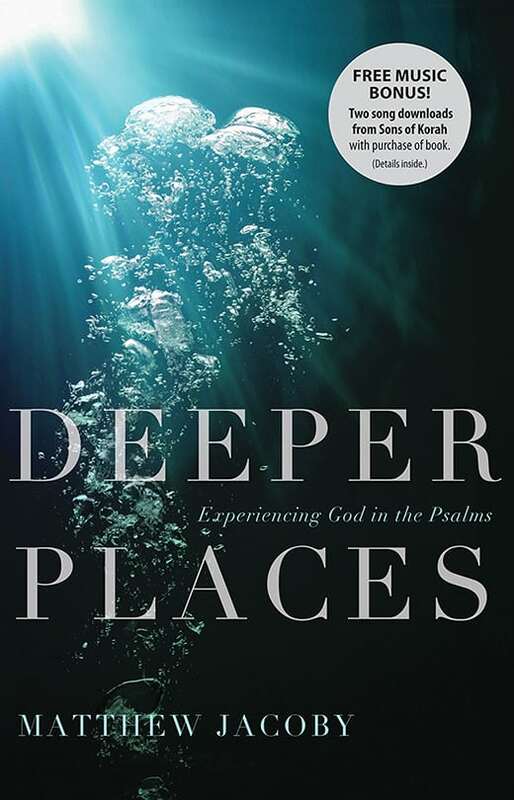 “This collection of thoughtful reflections on the Psalms is beautifully written and heartfelt. This is a book to be savored.”-Ruth Haley Barton, founder, Transforming Center; author, Invitation to Solitude and Silence. “Matthew Jacoby is a musician, a theologian, and a pastor-a unique blending of calling and gifting that makes him ideally equipped to explore the ancient Hebrew songbook.”-Stuart Briscoe, author, broadcaster, international speaker. Audio Book (MP3) Download read by the author. I have long loved Sons of Korah’s music, but didn’t know that Matthew had written a book until earlier this year. My husband had shown interest in it, not knowing more than a small card advertisement revealed, so I planned on getting it for his birthday. Once it arrived, I started reading through it and was completely dumbfounded that it contained what I had been hoping to find in some book out there. I have found this to be one of the most profound books I have ever read, and I have bought more copies than any book I have ever owned, giving them to all of my older kids and many friends. I have never done this before. I wanted feedback from those I gave it to, to see if this book was just something my personality connected with, but I have heard similar comments as mine. It is also my most highly underlined book next to my Bible. This book is truly about going deeper. I see it as a most gentle, solidly Biblical confrontation of our most basic problems, which amount to the things which interfere with our relationship with God. Mr. Jacoby uses the Psalms to help us see how to rightly work through the inevitable conflicts that will arise in our lives, first accepting the conflict in our relationship with God: We have made God sad. I was astounded at how he connected the dots for me in an area where I have spent much time, personally. I’m sure this is why this book has been so meaningful to me. I know that this was provision from my Heavenly Father. Even though this has been very personal to me, I believe that this book would equip Christians who are trying to get to the bottom of struggles, conflict, pain, hurt in their own lives as well as how to help others. It is insightful regarding situations in which believers are not overcoming strongholds, such as discontentment, anger, blame and controlling behavior, sabotaging the production of spiritual fruit. This is an area of application the author doesn’t label as such, but this is something it accomplishes. For those who find themselves ministering to or counseling those with a complexity of problems, what a help this book would be. A huge thank you to Matthew Jacoby for writing this book. It has profoundly affected my life and those around me.